Kayak, canoe or skate the world's largest zamboni-maintained ice rink. Pop back in for assemble-your-own sandwiches after a morning on the trails or bike paths. It's somewhat irrelevant when you have an indoor pool with views like this. Grab pillows and popcorn, and you're all set. Check out your options at the lakeside Adventure Center. Free shuttles make the quick ride to Keystone Ski Resort practically effortless. Soothe your aching muscles in the outdoor hot tub. Play a round at Keystone Ranch Golf Course, just an 11-minute drive away. 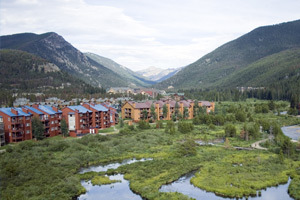 Designed around a gorgeous five-acre lake minutes from the slopes, Keystone Lakeside Village is hopping all year round. Each winter, Keystone Lake defends its title as the world’s largest zamboni-maintained ice skating rink, with hockey rinks built in and skate rentals for anyone willing to give it a whirl. Meanwhile, frequent (free!) shuttle service makes the short ride to the ski resort effortless – just gather all your gear and go. Summer opens up a whole new world of activity possibilities, with paddle boat races, or paddle-splash wars from canoes, kayaks and stand-up paddle boards (careful with that last one unless you’re planning on a “swim”). There’s even a sand beach, giant checkers game and a snack bar for ice cream “emergencies.” Rent bikes and wind your way around Keystone, or all the way to Lake Dillon and Breckenridge if you’re feeling superhero-esque. Plan to recover later with a soak in the indoor pool or hot tub, or go all out with a blissfully perfect day at Rock Resorts Spa. Lodge-inspired condos range in size from studios to sprawling four-bedroom retreats, depending on the size of your crew. Living areas give you plenty of room to spread out board games or go mano-a-mano across the chess board. The full kitchen makes cooking-in easy, giving you ample cabinet space for snack stashing in case the late-night munchies hit hard. Make breakfast one of the highlights of the day, with the full spread typically reserved for weekends-only at home. Outdoor BBQs and picnic areas are standing by for summer and shoulder season. Or you can bag the whole DIY thing and leave it to the pros at the waterfront Edgewater Café. You’re minutes from both Keystone Ski Resort and Arapahoe Basin Ski Area, plus the lake adds a welcome addition to both summer and winter mountain sports. When festival season’s in full swing, you’re in the heart of the action for events like the Taste of Keystone Food Festival, spectacular July 4th fireworks and lively Sunday Farmer’s Markets. Or hit the Keystone Adventure Center near the lodge for boat and bike rentals – they have Burley trailers and Tagalong bikes so the little ones can ride along. - Front desk is located at 21996 US Highway 6, Keystone, CO, 80435. To make arrangements for check-in please contact the property at least 48 hours before arrival using the information on the booking confirmation. Located at Loveland Pass' base and made up of three mountains: Dercum Mountain, North Peak and the Outback. Winter activities include skiing, snowboarding and ice-skating. You can even take a horse-drawn sleigh ride! There's plenty to do during the summer including mountain biking, golf and hiking.